Solutions with a pH lower than 7 are “acidic”, while solutions with a pH higher than 7 are “basic” (or “alkaline”). The range of pH is from 0 to 14 (actually it can go over this range but for the sake of our homemade cosmetics we won’t have to consider that), where pH 0 is “extremely acidic” and pH 14 is therefore “extremely basic”. The pH of pure water at room temperature is 7 and this is what we consider “neutral” because it means that the concentration of hydrogen ions (H+) is precisely equal to the concentration of hydroxide ions (OH–) which are formed as dissociation of water (I am sure you all know the formula of water: H2O). Sodium Hydroxide (which should be your best friend if you make soap) has a pH of 13.5 and this is why we must handle it with care. Well then, now we know what the pH is, but why should we care? Our skin has physiologically a pH that tends to be between 4.5 and 5.5. When formulating especially leave-in cosmetics it is essential to get the pH of the cosmetic as close as possible to the pH of our skin, in order to not unbalance it. Something that might be a surprise to some of you is that from the moment we are born our skin is covered by microorganisms that essentially “live with us” and help us fight against other external microorganisms (also pathogens). Unbalancing the pH of our skin might unbalance the life of these silent friends and leave our skin bare of its natural shield (this is actually a huge topic! Maybe I will make a post only about the skin in the future 🙂 ). All of the ingredients we use in our cosmetics have a specific range of pH where they “work the best”. You can look for this information in the MSDS (Material Safety Data Sheet) of the ingredient, which should be sent to you along with the ingredient when you purchase it (or you can request it to the reseller). Different ingredients can have very different ideal pH ranges and this can make them incompatible. Just to make it clear: pH incompatibility is not the only way ingredients can be incompatible, but we are talking about pH now so I will talk only about pH incompatibility. Sometimes pH incompatibility simply means that one of the ingredients doesn’t work as well as it would if it was in its preferred pH range. This is the case of an “internet favourite”: mixing L-Ascorbic Acid – aka Vitamin C – with Sodium Hyaluronate gel: because of the low pH, the HA breaks down forming only in very low percentage low-molecular-weight HA. Nothing dangerous forms but you have just wasted most of your expensive HA. Sometimes, however, things can get worse. There are in fact many ingredients that can become even dangerous if their pH range is not respected. It is the case, for example, of niacinamide, which is effective in a pH range of 6 to 7.5. At lower or higher pH it tends to separate and form nicotinic acid (niacin) which has a flushing effect and, depending on its concentration, can burn the skin (just as an example, on the MSDS of niacinamide you can read: Materials to avoid : acids , alkali , Oxidizing agents). So this is why you should ideally respect the suggested pH range of every ingredient in a formulation. no matter how many times you have repeated the same recipe, it is always good practice to eventually check the pH of your cosmetic. You might have mistakenly added too much of one ingredient, you might have changed supplier… but even if nothing of the sort happened, just repeat with me: it is always important to double-check the pH of your cosmetic. If, once checked, it results a little out of range, you can adjust it in few easy steps: adding few drops of an acid or of a base (I have already talked about this in “how to formulate”). Measuring the pH is pretty simple. You can use either strips or a pH meter. 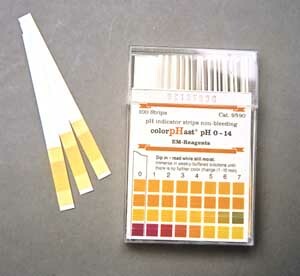 Even if a pH meter might be preferred, there are many different kinds of pH strips which can be used: I don’t suggest you to buy the simple yellow strips as they are not very precise; those like in the picture below are more accurate. Do you know how to measure pH of shampoo? your postings are superb. I want to subscribe. where can we find a good pH meter? I don’t have one yet!! I have been using pH strips so far. However you dip the rods in the cream. I am sorry I cannot be of more help here!! for that you have to make 10% solution of cream and directly put pH electrode in it. Hi! I am wondering how you measure the pH of soaps the right way. How much soap to add in the distilled water and check the pH? Technically I think I remember it should be 10% BUT real soap has high pH (should be 10% at least). this site is a true gift. Thank you. I have been making cosmetics by myself for one year now, but I want to understand things better and now I am truely amazed at what I find here. THANK YOU! I absolutely love your articles! I have only jus started being interested in natural products (about 1 month ago). As far as I know this is too high but how do I lower the ph level? Also, may I ask where do you get so much useful (technical, biochemical, chemical) information from? I would love to learn more about this subject but can’t seem to find much info e.g. difference between de-ionised and distilled water ( I bought de-ionised water from the car garage as couldn’t get distilled water anywhere else and ended up boiling it in the microwave in the glass container!). Grease fall article makes soooo much sense except it doesn’t include every single fat and oil available on the market so how can I find out how ‘heavy’ or ‘greasy’, ‘ight’ individual fat is? e.g. almond oil or mango, or any other? Deionized and distilled water are the same thing. I find distilled water in supermarkets to use in ironing. Then I boil it too. The best water would be PURIFIED distilled/deionized water, you wouldn’t need to boil that one. I cannot put all the fats in the world but usually you can check the density of an oil to understand how heavy or light it is. Compare its density to the others in the list and you are done. Ah sorry! About lowering the pH: add a small small amount of citric acid or lactic acid! Thank you so much for your informative sharing! I am a fresh graduate and just stepped in cosmetic field as a r&d personnel and thanks for guiding me so much on formulation. 1. I have been taught by colleagues that i should maintain the pH at around 5.5-6.5, slightly different from yours. Is this range acceptable? 2. It is ok to measure pH for o/w system but what about w/o system? because theoretically the pH could not be measured for this system and indeed it could not be done practically (i’ve tried it). 3. are there different acceptable pH range for different products? for example, lip product and eye products. are their pH different from skin pH? Yes that pH range is fine too! Skin is usually pH 5.5. Eye products usually have a little higher pH. Lips I am not sure as most of the products are anhydrous. Intimate detergents for fertile women can be around 4-5 pH and for children or women in menopause the pH of the detergent should be around 6. Thank you very much four your clear explanation!